Methods of experimental working out of BURAN, its units and systems designed in NPO MOLNIYA and other organizations are explained. The milestones of experimental working out, and the scope and kinds of tests for provision of the 1-st orbital flight of BURAN are considered. 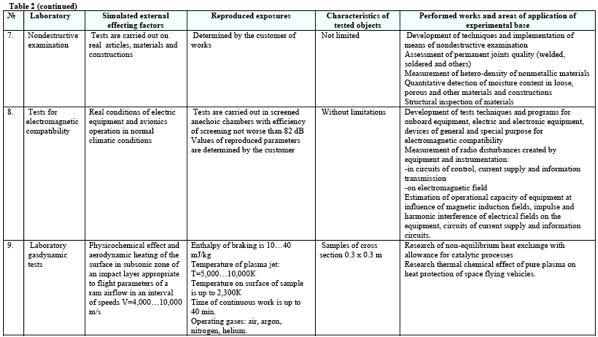 Characteristics of test laboratories of NPO MOLNIYA verifying the conformity of test conditions to actual ones of BURAN operation are displayed. The areas of application and list of accomplished works are shown, which are possible to executed using the experimental base of NPO MOLNIYA for the purpose of working out modern flight vehicles and other complex technical systems. The experimental working out BURAN was a complex of organizational and technical measures ensuring actual confirmation of its quantitative and qualitative indices and included experimental and research works and development tests (Figure 1). The main targets of experimental and research works (research tests) were: studying problem issues of design and properties of new structural materials, and checking out manufacturing process. The main scope of research tests was carried out at early stages of BURAN creation. During the workout tests, which completed the process of its creation (autonomous and complex) the correctness of engineering solutions was checked up, designer and fabrication documentation was specified and the compliance of BURAN characteristics with the requirements of TS was confirmed. All newly developed, upgraded or modified assemblies, units, systems and other components of an vehicle, which had a separate purpose, were subjected to autonomous tests. The purpose of these tests was the working out of operation in conditions close to real, assessment of the characteristics conformity to the preset ones, in particular the reliability assessment. Units, assemblies, systems and other parts of an vehicle were subjected to complex tests with the purpose of their joint working out and check of operation and interference under conditions close to real. The working out of BURAN stipulated the accomplishment of basic scope of tests in ground-based conditions. At flight tests only the workout was conducted which would be impossible or economically inexpedient in ground-based conditions, or would be necessary for confirmation of laboratory-stand tests results. The novelty of BURAN experimental working out was primarily connected with its reusable application and large overall dimensions, which required the development of new testing techniques and creation of complex testing systems. A scope of tests and testing procedure were determined by the reliability programs (RP) and complex programs of experimental working out (CPEW), proceeding from the optimum by quality, terms and costs philosophy of tests at all stages of BURAN creation. For example, for working out a set of all units of friction established on BURAN together with the Institute of Engineering the ‘leading units’ were determined, the technique of their tests and use of obtained results for functionality assessment of the appropriate groups of units of friction was created. With the purpose of reducing the terms of tests and costs of their realization, the preliminary and final tests were usually combined and the reliability tests were integrated with the tests for operation and confirmation of characteristics’ compliance to the preset parameters. The tests were carried out on four especially important samples of units of each name and on three samples for other systems. other researches on mockups and samples (lightning resistance, air-tightness, etc.). The second stage of experimental working out consisted of accomplishment of autonomous tests including working out the components, systems and units on special stands and versatile test equipment (strength, functional, vacuum-temperature, climatic, tribological tests and leak test). mockup-technological, ventilation and biomedical tests. The data of the tests for the 1-st orbital flight of BURAN are displayed in Table 1. As is visible from Table 1, the tests for influence of different factors were carried out on different samples of the vehicle. The optimum integration of tests for different units and bays was provided. Thus, for example, at tests of OK-TVA vehicle, the external elevon was subjected to tests for thermal strength and acoustic tests, nose spinner – to tests for thermal strength, vibration resistance, repeated static and other tests. It reduced the scope and terms of tests, costs of their performance and gave the necessary information for an assessment of operation capability of the construction. For experimental working out of BURAN orbiter ensuring the high reliability of its systems and units operation, it was necessary to create an experimental-stand base appropriate to the novelty and complexity of this task. With this purpose, in 1977, “Development of technological base of SRI, design bureaus and pilot plants of the branch for the period till 1990” plan for experimental working out of aerospace vehicles was developed. The section concerning the experimental base of NPO MOLNIYA has made the fundamentals of this plan and was performed by NPO MOLNIYA and GIPRONIIAVIAPROM with consideration of proposals on reconstruction and development of the experimental base received from TsAGI, SibNIA, LII, TsIAM, NIAT and other organizations of the branch. 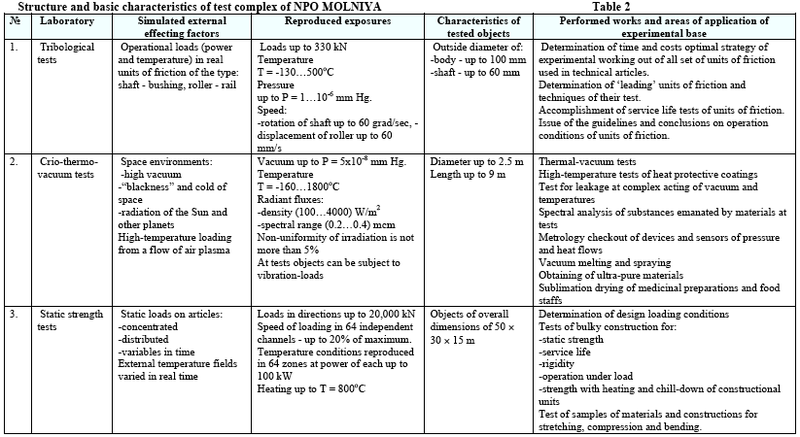 Technical specifications of creation of unique test facilities were developed at NPO MOLNIYA, in which the required characteristics of the facilities and simulated external exposures and factors were preset. Some of the largest test complexes of NPO MOLNIYA – complex of thermal vacuum tests, laboratory of tribological tests – had no analogs in the USSR and Europe. At all stages of experimental working out of BURAN airframe and its systems, 370 stands and facilities, including 248 existing and renovated, 122 newly created, including 64 for testing the objects designed at NPO MOLNIYA, 58 - for the objects designed by allied manufacturers were involved. The unique test equipment was equipped with the automated system of experiment control, systems of measurement and control, and necessary metrology aids. 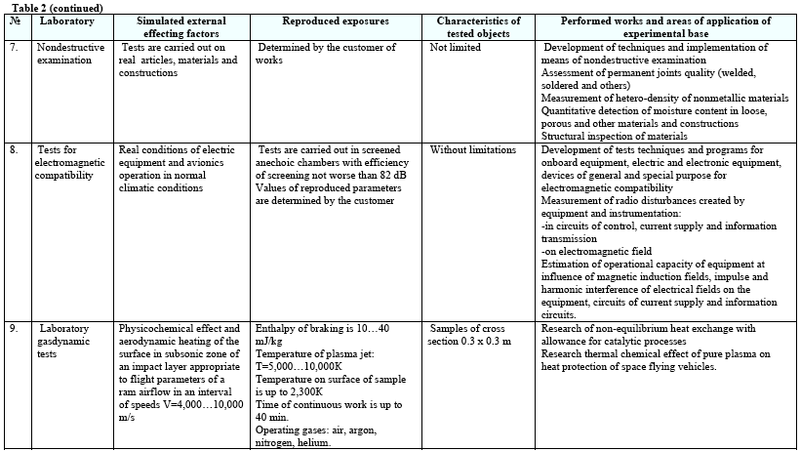 Performances of test equipment of NPO MOLNIYA experimental base verifying the conformity of test conditions reproduced by test equipment to the real conditions of BURAN operation, and the areas of application of NPO MOLNIYA experimental base are shown in Table 2. The test complex can be upgraded and re-equipped for the tests of particular vehicles. All test laboratories are accredited State Standard of the Russian Federation according to the System of Certification of GOST-R for technical competence and independence as test centers of Russia. The certificates are registered in the State Register of GOST-R System of Certification. The methods of experimental working out of BURAN and the created modern test base allowed to provide, with high quality and in short terms, confirmation of the orbiter’s performances which stipulated the success of its orbital flight and automatic landing.